Cable stereo 3.5mm/M - 2x6.3mm/M, 5m, dark grey A professional audio cable that has one standard 3.5 mm jack and two 6.3 mm jacks. The cable is copper with PVC insulation and gray color. Audio cable Earldom ET-AUX23, stereo 3.5mm / M - stereo 3.5mm / M, white Audio cable ET-AUX23 with 3.5 mm jack for 3.5 mm jack for stereo audio signal transmission and 1.8 m long stretched. Cable, Jack 3.5 stereo / m-jack 3.5 stereo / m, 1m Audio cable, jack 3.5 stereo/m - 90 degrees angled jack for audio signals transmission. Length - 1m and gold plated connectors. Cable, DeTech, Jack 3.5 M-Jack 3.5 M, 1m, elastic, black Cable 3.5 mm jack 3.5 mm jack, 1m long. Cable Jack 3.5 F - USB TYPE-C M Jack 3.5 F cable - USB TYPE-C M gold color and braid. Cable, DeTech, Jack 3.5 M-Jack 3.5 М, 1m, elastic, blue Cable Jack 3.5 M-Jack 3.5 М, with length 1 m.
Cable, DeTech, Jack 3.5 M-Jack 3.5 М, 1m, elastic, orange Cable Jack 3.5 M-Jack 3.5 М, with length 1 m.
Stereo cable 3.5mm M - 2 x 3.5mm F, black Stereo adapter (splitter) 1 x 3.5 mm male to 2 x 3.5 mm female. Cable, Jack 3.5 M-Jack 3.5 М, 0.9m, silicone pink Cable Jack 3.5 M-Jack 3.5 М, with length 0.9 m.
List Price 3.25лв. VAT Incl. 3.08лв. VAT Incl. 2.92лв. VAT Incl. Cable KNA22200E20, stereo, 3.5mm/M-2xRCA/M, black Cinema cable KNA22200E20 with jack 3.5 stereo male to 2 x RCA male and length 2 m. High quality product ideal for connecting home theater to PCs, laptops and more. List Price 7.99лв. VAT Incl. 7.58лв. VAT Incl. 7.19лв. VAT Incl. 6.78лв. VAT Incl. 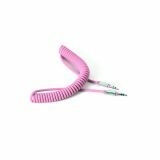 Audio cable, plug 3.5 stereo/m-plug 3.5 stereo/m, 1m, pink, flat Extension audio cable, jack 3.5 stereo / m to jack 3.5 stereo / m for transfer of audio signals, length 1 m and pink color. Cable, plug 3.5 stereo/m-plug 3.5 stereo/m, 1.5m Audio cable, jack 3.5 stereo/m to jack 3.5 stereo/m, 1.5 m for transfer of audio signal. List Price 1.80лв. VAT Incl. 1.71лв. VAT Incl. 1.62лв. VAT Incl. 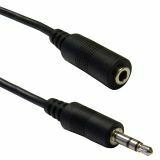 Cable, plug 3.5 stereo/m-plug 3.5 stereo/m, 10m Audio cable, jack 3.5 stereo / m - jack 3.5 stereo / m for transfer of audio signals, with the length of 10 m.
Cable stereo plug 3.5mm/M - 2x6.3mm/M, 1.5m Professional audio cable SWOP23200E15, stereo plug 3.5/m - 2xplug 6.3/m mono, 1.5m. List Price 15.90лв. VAT Incl. 15.09лв. VAT Incl. 14.31лв. VAT Incl. 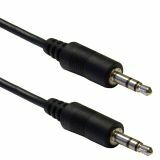 Cable SWOP23200E30, stereo 3.5mm/M to stereo 2x6.3mm/M, 3m, gray A professional audio cable that has one standard 3.5 mm jack and two 2x6.3 mm jacks. The cable is copper with PVC insulation and gray color. List Price 17.90лв. VAT Incl. 16.99лв. VAT Incl. 16.11лв. VAT Incl. List Price 2.90лв. VAT Incl. 2.61лв. VAT Incl. 2.46лв. VAT Incl. 2.32лв. VAT Incl. 2.17лв. VAT Incl.